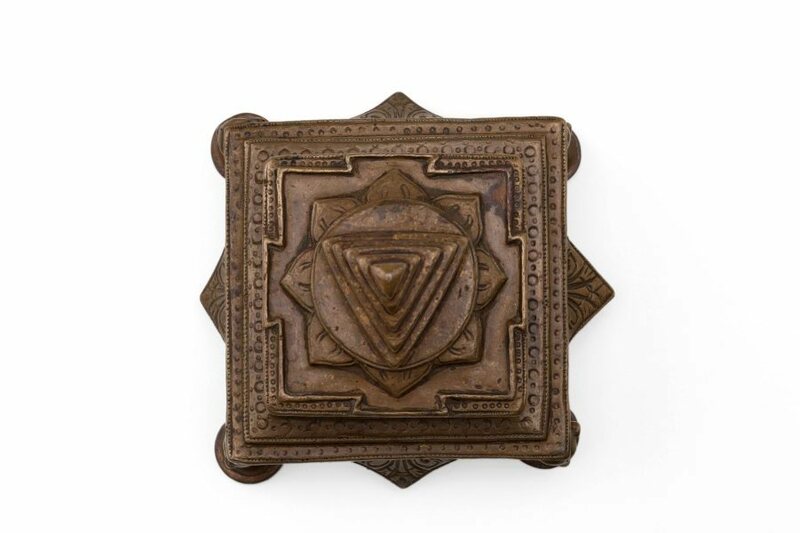 The 'yantra' sculptures present with seemingly extraordinary simplicity profound spiritual ideologies. Indian religious thought is built around the fundamental principle that all existence emerges from a single point of origin and it is to this point that everything ultimately returns. The central quest of Indian spirituality is to understand the relationship between the individual and universal and to achieve experiential realisation of the One. Sacred diagrams ('yantras') illustrate this fundamental notion in abstract form and, indeed, map out an individual's spiritual journey. Although 'yantras' make charming display objects they are in fact ritual tools and belong to the Tantric religious tradition of India. By definition, 'yantras' are sacred dwellings or receptacles that contain the essence of a divine being. During a ritual, a practitioner will make special offerings to the deity housed within the 'yantra' and use the diagram as a meditative support to stimulate latent psychosomatic energies. The yantra shrine, is a compacted replica of the cosmos. It consists of a raised pedestal that supports the sacred square field of the diagram. A lotus, at the centre of which arises a stepped pyramid, lies within the confines of the square. The pyramid most likely denotes Mount Meru, the axis mundi and imagined ordering of the entire world system in Indian thought. 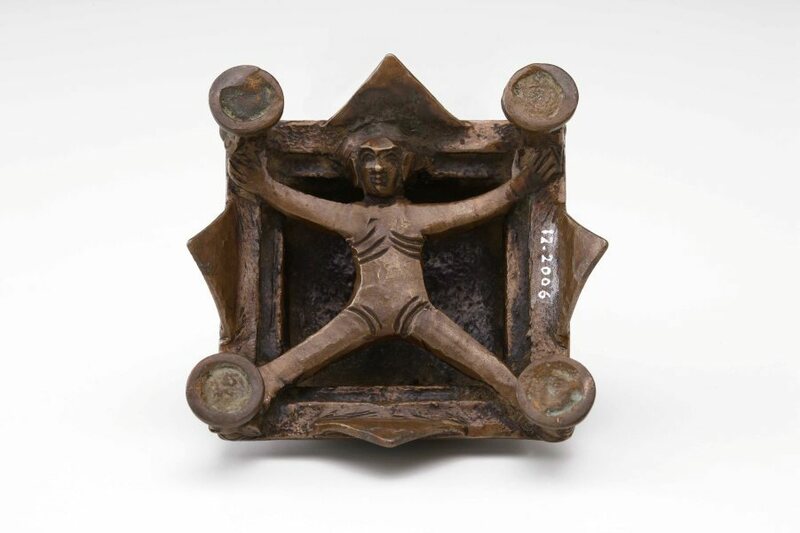 The underside of the object shows a figure in spread-eagle position. This figure probably represents Vastu Purusha and indicates that the ground plan of the yantra shrine is a Vastu-Purusha Mandala—a diagrammatic ordering of the cosmos used as a model in South Asian sacred architecture. Asian Art Department, AGNSW, February 2006. The series of triangles within an eight-petaled lotus indicates that this object is a three-dimensional Kali ‘yantra’. Simultaneously, it represents Mount Meru, the ‘axis mundi’ and imagined ordering of the entire world system in Indian thought. The underside of the object shows a figure in spread-eagle position. 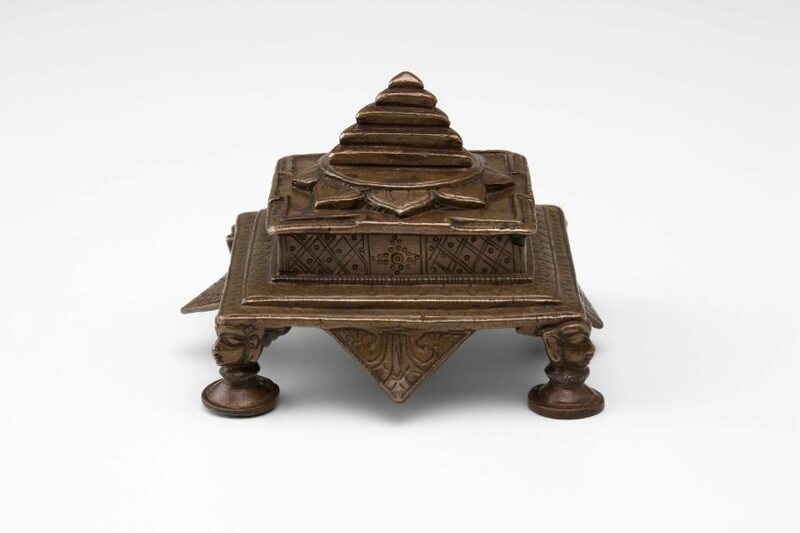 This figure probably represents Vastu Purusha and indicates that the ground plan of the ‘yantra’ is a Vastu-Purusha Mandala – a diagrammatic ordering of the cosmos used as a model in South Asian sacred architecture. Chaya Chandrasekhar, ‘Goddess: divine energy’, pg.168.